Tech-phobes beware: inspired by the IF prompt "Toy" I've decided it's finally time to put aside my ink-stained Luddite ways & share my thoughts about my favorite, magical new toy/torture device: the iPad. I received it as a surprise Christmas gift, for which I'm enormously grateful because I would never have bought one for myself, & now I'm completely addicted to this brilliant little package of wonders. It's the perfect size, just like a sketchbook, easy to use on lap, desk, or cafe table (even in bed-- & no paint spills! -though I try not to do that too often). It's not feather-weight, but still relatively easy to lug around, & full of possibilities. Another major frustration is the lack of pressure sensitivity. For artists used to the wonders of Wacom & super-sensitive programs like Photoshop & Manga Studio, it's quite a leap backwards. I nurse a fond hope that Apple will someday develop an iPad tweaked for artists, with greater precision & a pressure sensitive stylus. Despite my cheapskate ways & severe mall-phobia I think I might join the crowd waiting in line for that one! By contrast, I've also done some stylus exploration, & here I've found a clear, hands-down, knock-out-the-competition favorite-- the Nomad Brush. It is surprisingly beautiful, handles like a real paintbrush, moves with a silky smooth touch on the pad surface (unlike some pen-type styli that have an irritating rubbery drag factor or require excessive pressure) & can be held at any comfortable angle (again unlike many pen-type styli). For now it only comes in one size, but I eagerly await the developers' promised size & bristle variations-- of course the inherent limitations of the iPad again come into play here, but a smaller brush might still be nice for greater stroke visibility & somewhat improved precision. I still feel like a rank beginner at this & have been very shy of sharing my wobbly efforts, but I think the time has come to be brave. So. The image above was created with the Brushes app, using my fingers & the Nomad Brush. The background texture & text were imported from scans of non-digital stuff, saved to my iPad photos, opened by Brushes & used as the base layers. All blending, layer effects & such were done on the iPad. Next post: I will begin sharing my experiences with all of the different paint apps I've tried, comparing features, offering tips &c. If you thought this post was tedious & long-winded, gird your loins for a real verbal onslaught, folks! But I hope it will be full of info that will help you avoid frustration & wasted money if you want to make art on the iPad. 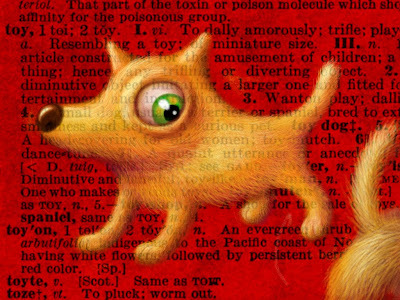 edit: Just found out "Toy" was added to the Nomad Brush Gallery! Thanks, Nomads! this is great for an iPad painting! i should get one too. I think it's always fun to learn new ways of creating. Fun dog. Have a great time with your toy! Wow Leah! You have taken to the Ipad like a fish to water. This is great. Love the character.... and the style and colors ROCK! Nice one! very fun pup! I got my "toy" as a surprise b'day gift and love it. This is really nice, and I appreciate the thoughts on working with the iPad. I also love my iPad!